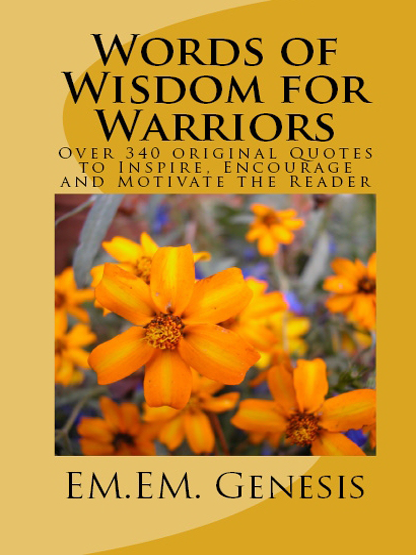 WORDS OF WISDOM FOR WARRIORS – EM.EM.GENESIS! Over 340 original Quotes to Inspire, Encourage and Motivate the Reader! Click on “Buy Now” Button below to order Paperback or E-Book copy. This is an inspirational and motivational book dedicated to all those life’s warriors who make a difference in other people’s lives daily. We are all warriors in life and we all need to be inspired from time to time. A Warrior is not a victim! One who doesn’t give up! One who turns failure into success! One who despite life’s problems continues to persevere! A Warrior is a mother, a father, a brother, a sister, an aunt, an uncle, a daughter, a son!